Early May 1969: First attempt. Photo: Angus McBean. In early May 1969, photographer Angus McBean and the Beatles returned to EMI House to recreate the cover photo from the "Please Please Me" LP for their upcoming LP, "Get Back". However Angus found that EMI had constructed a new porch which prevented him from photographing the Beatles from the exact same perspective as he had done in 1963. Pictures from this day feature John and George wearing different jackets. 13 May 1969: Second attempt. Photo: Angus McBean. When EMI House heard that the exact photo angle could not be replicated, they agreed to have the new porch taken down temporarily. The Beatles and Angus then returned on May 13 1969 at 6pm for another attempt. Pictures from this day feature John and George wearing pin stripe suits (their 1966 tour suits). A bootleg LP featuring one of the three versions of the "Get Back" LP. 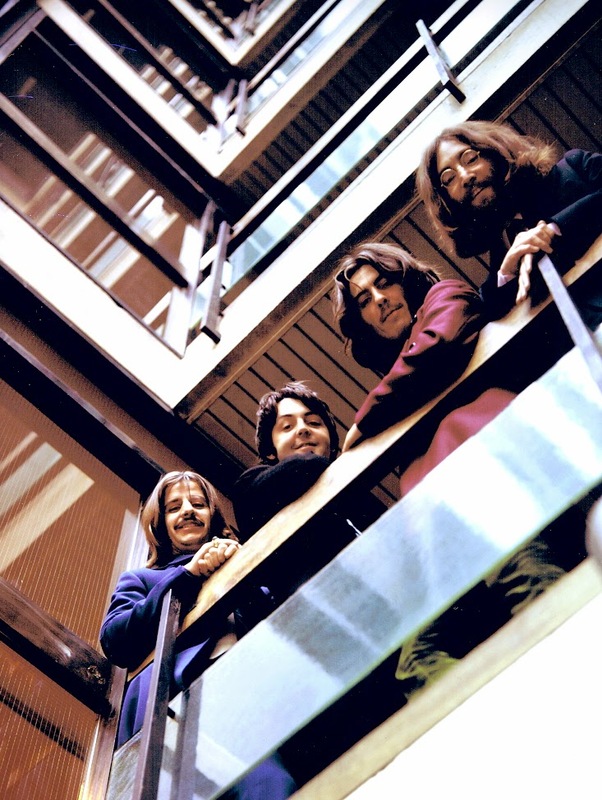 The recreation of the "Please Please Me" cover shoot was probably not an attempt to bookend the Beatles' recording career, it was merely an idea sparked by the original intention of the "Get Back" LP project of the Beatles going back to their roots, again recording an album without studio trickery like overdubs. In an interview with Terence Pepper for a book about Angus McBean, Paul McCartney says that the idea for the "Please Please Me" cover recreation came up at a Beatles group meeting, and that they all thought it was a fun and "full circle" idea. Photographer Angus McBean himself has also recalled the occasion: "(In 1963) I asked John Lennon how long they would stay as a group, and he said, "Oh, about six years, I suppose – who ever heard of a bald Beatle?". Well, it was just six years later that I was asked to repeat the shot with the Beatles as they now looked – very hairy indeed. When I got there I couldn’t retake the shot; a new porch had been built and I couldn’t get into the same position. However, EMI asked if I could come back in a week. Meanwhile, the whole new porch was pulled down and we tried again. Ringo Starr was so late that the staff of EMI was streaming down the stairs. I got the camera fixed up and John, fascinated by photography, came and lay down beside me to look at my view-finder. I can still hear the screams of the EMI girls as the realized who they were stepping over to get out the door!" 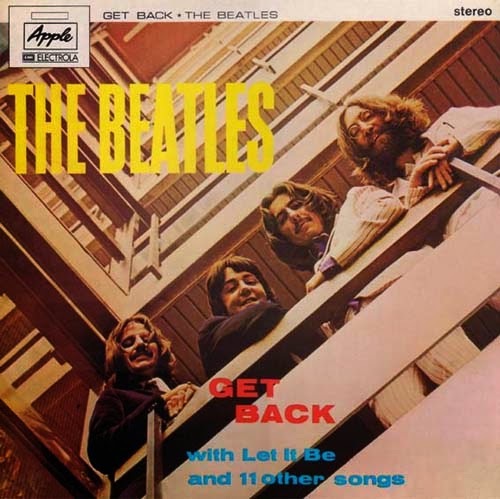 When the "Get Back" project was reshaped into the "Let It Be" album, the cover idea also went out the window, and no one has really explained why. Indeed, John Lennon himself wondered what happened to that idea, but no one has stepped up to give an explanation. Our best guess is that with Paul McCartney sporting a beard in the whole of the "Let It Be" film and John being clean shaven, the "Get Back" photo would seem out of place, adorning the accompanying album. Still, it finally became a bookend of sorts with the release of the red and blue albums in 1973. 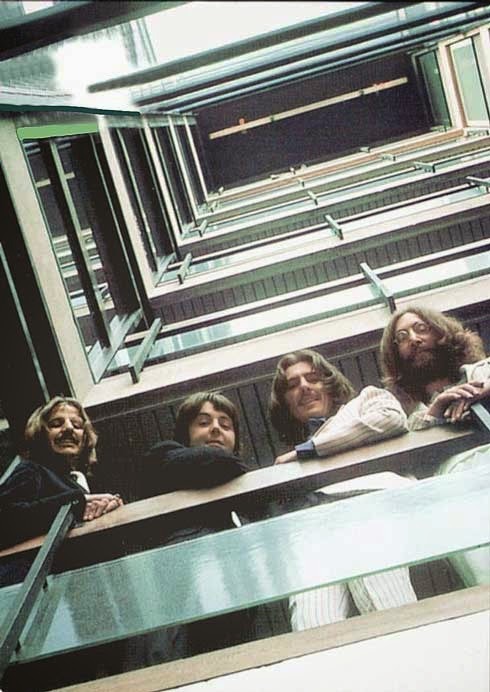 As discussed in the previous post, perhaps it was simply that while the balcony shot was appropriate while the Get Back concept stood, once the album became Let It Be that cover no longer seemed suitable, given that it had now become the group's final album, and also was now being intrinsically tied to the film and the book (which was not originally the case)? As per discussions on previous post, the 'Get Back' project was, really, an album idea in essence. The 'movie' portion was more by way of documenting the process for that album for some as yet undecided TV or film use. When the movie had become such, ie after Klein had offered it to UA, the album, already in deep trouble, disappeared. Thus 'Get Back' did not have a change of title. Rather, a movie called 'Let It Be' developed a soundtrack album. you can see the dark suits, in a shot clearly taken from the correct angle (ie the later session), almost identical to the white suit images. There's also another one with just John in dark, George in white. The only logical solution is that the dark suits have been artificially coloured in, which throws up a question mark over whether they were ever actually photographed in dark suits, and whether the 'early' photo from the wrong angle is indeed from a different session. The coloured-in one has the same shade on George's jacket. I was lucky enough to meet Glyn Johns at a Q&A in the former Studio One at Olympic Studios in Barnes, South West London, last night. The recording studio is now a cinema, keeping many original features, and made the perfect setting for Glyn to reminisce about his work in Studio One with the Stones, Who, Eagles etc. Naturally I asked him about Get Back, which he mixed at Olympic (twice! ), and he explained what he was trying to achieve with the track and take selections he made. And then he offered to let me hear some Beatles recordings from his personal collection...gulp! Yoko bought Lennon's former home? The Beatles on Calderstone: Singles next?